If you take in some of the bonus features on the Blu-ray of Rebecca, you will learn a little about the Gothic romance genre, or the subgenre that the Daphne DuMaurier novel belongs to. Such stories have a young naïve woman falling in love with an older man, going to his sweeping estate and uncovering the deep dark secrets lying within. Think of it as the flip side of the princess happily-ever-after story. Schickel’s commentary mentions two instances where the movie diverges from the book. He is right about the first change, but wrong about the second one. He says that the scene at the doctor’s office was changed. It actually follows the book very closely. Alfred Hitchcock’s adaptation of DuMaurier’s bestseller is faithful to the novel, while diverging from his own formula. Many of his best films from the 1930s ( The 39 Steps, The Lady Vanishes) balance suspense with sexual tension between the lead characters. In Rebecca, the tension instead plays out between our protagonist and her predecessor, who is embodied by a mysterious mansion and kept alive by her sinister servant. Joan Fontaine plays the nameless heroine, swept off her feet by the dashing widower Maxim DeWinter (Laurence Olivier) and into Manderley. Her physical tics and dull tweed skirts set her apart from the first Mrs. DeWinter. Rebecca was charming and glamorous. Rebecca knew exactly how to run Manderley. Rebecca commanded the respect of the staff and the undying loyalty of her housekeeper, Mrs. Danvers (a commanding Judith Anderson). But who was Rebecca, really? And why won’t Maxim talk about her? Will our heroine ever grow a spine? You may find yourself frustrated with Fontaine’s character, so timid and easily flustered. On the other hand, you might be able to identify with a young, inexperienced person, who is completely out of her depth. Readers of the book will find that the movie is a good adaptation of a book. Viewers who are unfamiliar with the book will find that Rebecca is a good movie. The Blu-ray has no main menu screen. After the usual disclaimers, the movie starts playing. Pressing the pop menu button on your remote will pull up a simple, easy-to-navigate menu while the movie plays. Film critic Richard Schickel provides the commentary track. Much of his commentary centers around the conflicts between Hitchcock and producer David O. Selznick. Schickel also points out elements of the film that concerned the censors. After about 40 minutes, he runs out of things to say, and starts telling us what we’re seeing on the screen. Thankfully, Schickel doesn’t feel the need to fill every minute with commentary when he has nothing to add. A second alternate soundtrack has just the music and sound effects. Watching it this way makes one realize that just about every second of the film has musical accompaniment. It’s also interesting to note how well the music conveys the emotions on the screen. The Making of Rebecca (28 minutes) covers much of the same ground as Schickel’s commentary, but in a more concise manner. The Gothic World of Daphne DuMaurier (19 minutes), gives some background on DuMaurier, the adaptation of her book for the big screen and the Gothic fiction genre. There are two screen tests (9 minutes in all), one with Margaret Sullavan (who voiced the protagonist in a radio adaptation of the book), the other has Olivier and Vivien Leigh (the soon-to-be Mrs. Olivier). Both actresses seem a little too self-assured to play the heroine. In an audio interview on the disc, Hitchcock says that he had decided on Fontaine early in the casting process, but Selznick wanted to test many actresses to generate publicity for the film (as he had done when casting Gone with the Wind). That factoid is from a portion of an interview with François Truffaut (9:15 long). The disc also has about four minutes from an interview with Peter Bogdanovich. Hitchcock is good at talking about his movies. Both clips made me want to hear Hitch talk about the rest of his career. Another feature worth checking out is three radio adaptations of Rebecca. All are about one hour long, complete with advertisements. The most interesting is the first one, from 1938. It’s directed by Orson Welles (who also plays Maxim). The announcer at the beginning apologizes for the recent furor caused by Welles’ recent “War of the Worlds” broadcast. It also features a lengthy and scrumptious description of Campbell’s chicken and rice soup. Finally, the disc has a theatrical trailer. 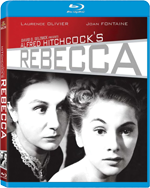 Rebecca is presented in its original 1.33:1 aspect ratio. The picture is crisp and clear. It’s so crisp, the film grain is noticeable, but never distracting. The sound is as good as can be expected from a 71-year-old movie. That is, it too is crisp without hissing or other distractions. Pop it in and play the movie. Afterwards, go back and watch a bit with the isolated music and effects track. You probably won’t want to watch the whole movie this way, but a few minutes should be interesting. Another night, check out the two featurettes and the audio interviews. Might as well look at the screen tests, since they are short. Finally, check out the radio plays. No need to listen to them all the way through, but the introductions and closing announcements are interesting.